ESEE Izula: What's so special? Discussion in 'General Knife Discussion' started by VolundoftheForge, Jun 21, 2012. I'm sure they're nice and all, but it seems 1095 neck knifes are pretty common. What makes them so great? Thanks. For what they are, I found the size a little too big and a little too small, but never just right. However, the no questions asked warranty is something you don't see with other companies. It was the perfect size to help teach my son and nephew some fire making skills and with the right sheath sits nicely in a pocket. I've opted, instead, to carry the Candiru, though, because in my situation it just works much better. Fair enough. Wouldn't the ESEE 3 be about the same thing but a little larger? Not a big fan of sub 3" blades without good reason. I have the Izula II and feel that it's a fantastic little knife. I never carry it around the neck - usually in a leather sheath in my pocket or clipped to my belt. I like having the ability to easily carry a fixed blade in my pocket when I feel like it. I tend to use it as a yardwork knife, but I carry it at the office quite a bit, as well. In my observation, both the belly of the knife and the angle of the blade as it extends from the handle ensure that the Izula has great cutting potential. It definitely has some "bite" for being so small. I've also noticed that my hands don't tire quite as quickly using that Izula as when I'm using some other small fixed blades or folders. The warranty is pretty great, as well. What's so special about it, to me, is that it's a fantastically capable little utility knife that is equally at home on a trail, in a kitchen or in a backroom breaking down boxes. Mine has prepped a fire and served as a steak knife on many a trip. It carries unobtrusively. The heat treat is dead-on. I could go on for hours about that little workhorse. Get one and try it out, and I mean carry it and use it. It's not exciting to look at, it's meant for work. The izula IS one the perfect edc fixed blades. I've owned and esee 4, 6, and an Izula. I sold the 4 and the 6 and kept the Izula. It's a great little knife. Have you ever handled one? Totally see that for some people with large hands the handle maybe too small, but if it fits you, it's superb; just feels right. As already mentioned with the guarantee that comes with the knife, I don't think there's a better deal out there. As an outdoor instructor it's one of the knives I recommend; it's cheap, light, easy to use, does whatever you ask of it and never complains. It came out when there really weren't a large number of 1095 neck knives available. It's a great design and very popular with the modding community. It's about perfect for small camp chores or EDC if you can carry a fixed blade. 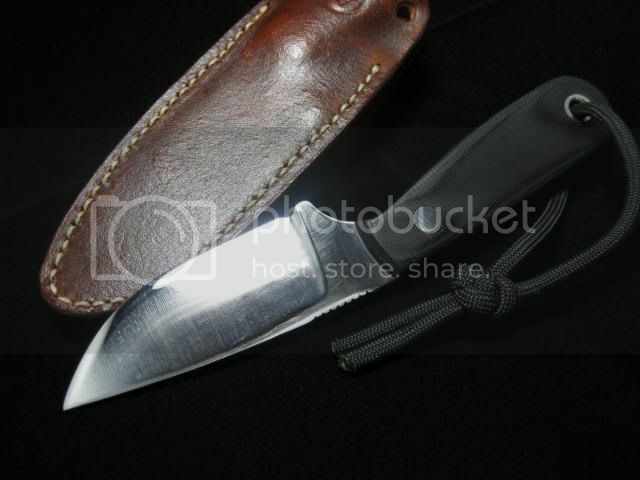 With handles, it's very comfortable, and the sheath is well done. I find it a great size for EDC when you want something tougher than a folder. Besides that, they have a great sheath, and come from a great company. It's very lightweight. You can put scales on it or use a paracord wrap. The steel and coating are good. It's easy to sharpen. The warranty is no questions asked and covers the item even if someone other than the original buyer makes a warranty claim. I like to wear mine clipped to the belt. It's small yet large enough to do a variety of tasks. For me, the warranty, toughness and quality, value is decent enough, good design. It has its imperfection like everything else, for me the jimping is uncomfortable, but it's a good knife. Rayban, did you make those scales or purchase? They are coated 1095 in a small cheap Fixed blade, nothing really special about that. And the hardness is on the lower side to boot. Bump that hardness up in the 63-65 HRC range and sell them uncoated and that could make them somewhat interesting if they were ground thin enough. I thought they were the same hardness as all of ESEE's offerings, 56-58 range. Made em, they are G10. Looks great, need to learn how to do that. I have never been happy with the short factory scales. Im too cheap to spend $50.00 dollars on the longer after market scales that cost as much as the knife. You did a good job. The Izula is great for me when I like to carry a small fixed blade. I have had not issues at all with it and it performs great for my uses.